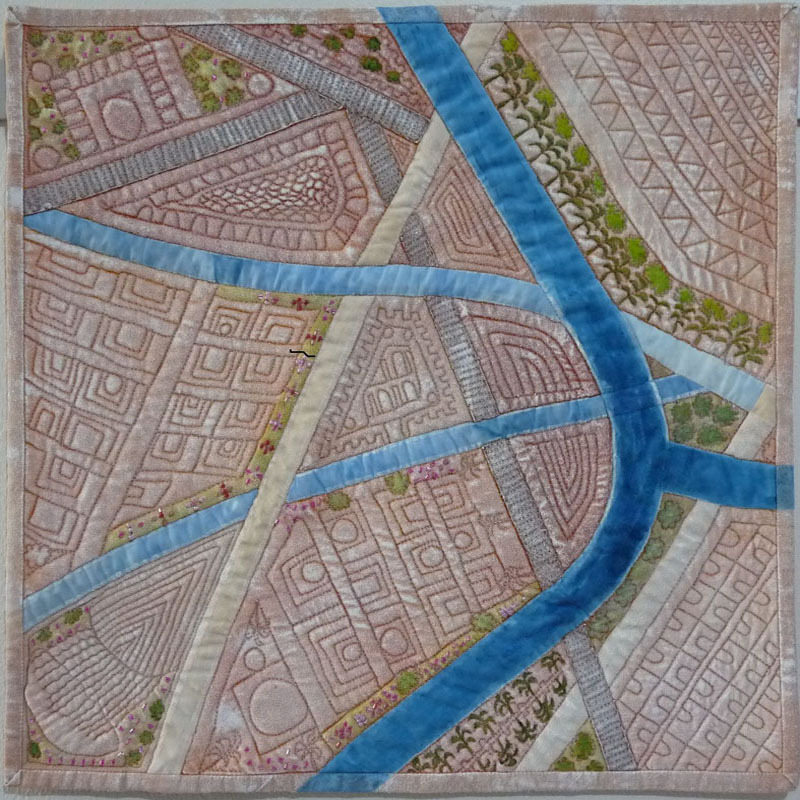 This small art quilt has developed organically from a photograph of a bluebell wood (taken near my home in Wiltshire) to a somewhat abstract map of Muscat (my new home in Oman). On arrival in Oman my first impression on arrival at the end of August, (excluding the +40 degree C temperatures ) was one of an oasis in the desert. Everywhere one can see tints of any one of the 4 hues in the colour wheel with orange in their name, either in the natural landscape or the stone of the buildings. The biggest shock though was the amount of greenery that abounded and the spectacular splashes of vivid pinks everywhere, in the form of bougainvillea bushes. Then over the next 2 months, as the weather began to cool, before my eyes the city was transformed as thousands of petunias were planted by the municipality or the population. As I worked in my sketch book I realized I was creating a map and as I drove around Muscat trying to learn the strange road system often I was reminded of my sketches. And so I decided to use the colour scheme I was seeing every day here in Oman. The cerulean blue is not water though but rather what can be found in abundance at the Grand Mosque and also often in the painted and tiled decorations of the buildings. As it is the complementary of yellow orange, one of the four orange tints used in my colour scheme, it seemed apt. The design has been hand pieced over papers (the English method)and then heavily free motion quilted. After binding white acrylic paint has been applied over the while surface. This has muted the colours and seems to me to represent the dust layer that hangs over the hills and city most days, a combination of building dust from all the construction going on and the general dust one finds in any country that receives virtually no rain. I have then added green fabric paint to some of the quilted designs such as trees and palm trees and some areas to indicate grass. Finally a variety of glass beads have been stitched to represent the flashes of pink bougainvillea bushes and the more formal flowerbeds in the grassed areas. Overall I am reasonably pleased with my first official art quilt.